A whopping 100% of iRestore users who participated in our clinical study grew more hair. Will it work for you? We’re here to help you find out. Feeling like you’re losing your hair? Well, you’re not alone. Most people lose an average of 100 hairs from their scalp, everyday. It’s simply normal. Both men and women suffer from genetic hair loss called androgenetic alopecia, which affects an estimated 50 million men and 30 million women in the United States alone. 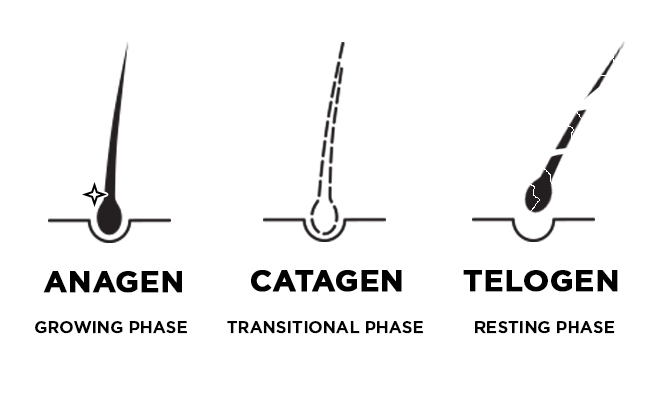 Your hair is either growing (anagen phase), stagnant (catagen phase), or resting (telogen phase). In the telogen or resting phase, your hair follicles are prone to shedding and thinning. So what can you do about it? This is where low-level laser therapy comes in as a viable option. In recent years, low-level laser therapy (or LLLT) technology has emerged as a home-based solution to support hair re-growth. iRestore has championed the use of this technology through our flagship device, the iRestore Hair Growth System. Read more about the history of LLLT, how it works, and it’s benefits for hair loss in this Modern Aesthetics article. Last Fall, a clinical study was conducted on the iRestore device, where a total of 40 subjects were recruited to participate in a 16-week study. The results were simply astonishing. There was an overall incremental improvement of 38% hair growth in iRestore study subjects, compared to controls. You can read more about our clinical study on our blog here. Many hair loss sufferers have seen positive results with consistent treatment and time with Low-Level Laser Therapy. You’ve already taken the step in the right direction by doing your research, and the next step is trying iRestore, risk-free with our 6-month money back guarantee. Laser hair growth offers a lot of potential with little to risk, and more hair to gain. Start experiencing results today!